Did humans domesticate the dog or was it a mutual sort of co-evolution? It's been suggested in the evidence found around Mt Carmel (namely a Nafutian grave site. The hand of the buried woman still in place on a puppy laid next to her). Another grave has a fox buried alongside a woman. Does the burial symbolism mean that the animal was valued in the same way we value our pets today? Probably not, more of a co-dependence. Dogs and foxes would be good scouts, signal interlopers, large prey etc. Dogs would learn the reward for following humans, the trash heap. Ever notice in India at the sacred Rat & Monkey temples where people feed enormous amounts of food to the animals ? Dogs are also everywhere waiting for scraps, they have a pretty low status in India. Does that mean our relationship with dogs could go back to proto human? Could well be. Wild dogs would soon learn that human food cast offs was easier perhaps than hunting wild prey. In time, those dogs would become dependant on humans, who, in turn, would find that dogs were remarkable companions, watch dogs and defenders. Unlike human, dogs give their owners unconditional love, and they deserve it in return. I agree, but also note that dogs are individual characters like other mammals and some are hardwired to be nasty (The alpha male syndrome being one reason among others). Wolves, being co-operative animals, would have quickly cottoned on the activities of prehistoric hunters and it does seem a relationship evolved, though domestic dogs are more likely developed from wolf cubs brought up among human beings. From the Neolithic onward when agriculture tended to tie human populations to the land, settlement would have caused a rift with native wolf packs who had different survival agendas and thus they became a danger again, leaving domesticated wolves as a breed apart. Yes, thanks Caldrail, I agree. But many humans don't realise that dogs are individuals, and react differently to circumstances and stimuli. We had a case recently here in Tasmania where some neighbouring kids were perpetually annoying a next door dog. The kids came into the yard and stabbed the dog, which retaliated. A court later ordered that the dog be put down because it was damgerous. This has caused outrage in the community, as the dog is said to have been protecting itself, remember it had been stabbed, and it's owners property. The government has been forced to review the law in such cases (Kobi's Law). We don't have wolves here, only Dingos, which, if found at a young age, can be domesticated. Wild Dingos are dangerous though. The study on Siberian foxes illustrates the individual temperaments of canines very well. Certainly the dogs who had less fear of humans and maybe even affection for humans would become attached quickly. I've done volunteer work with shelter dogs and even the ones who were harmed by people are usually able to bond again, even if it's only with one person. Pretty damn resilient, amazing animals. I think they are responsible for a dimension of our evolution. I have two dogs, one was a free give-away from a private home, and I got him when he was about six weeks old. He's now 16. The second I purchased from the Dogs Home, she had been surrendered by her owners who didn't want her and her brother. She's 4yrs old. Not only have my dogs bonded with every member of my immediate family, but they also get along very well with our two cats, who came after them. Dogs have evolved to love their human families and as you know, are readily trained to assist human in a variety of tasks. I found an article on Dog Evolution the other day, I'll see if I can find it again and post some of it. Much of the fossil record for dogs consists of mandibles. However, can fossil canid mandibles be reliably identified as dogs or wolves? 3D geometric morphometric analysis correctly classifies 99.5% of the modern dog and wolf mandibles. However, only 4 of 26 Ust’-Polui fossil mandibles, a Russian Arctic site occupied from 250BCE to 150CE, were identified as dogs and none of the 20 Ivolgin mandibles, an Iron Age site in southern Russia, were identified as dogs. Three of the Ust’-Polui mandibles and 8 of the Ivolgin mandibles were identified as wolves. In contrast, all 12 Ivolgin skulls and 5 Ust’-Polui skulls were clearly identified as dogs. Only the classification of the UP6571 skull as a dog (Dog Posterior Probability = 1.0) was not supported by the typical probability. Other evidence indicates these canids were domesticated: they were located within human dwellings, remains at both sites have butchery marks indicating that they were consumed, and isotope analysis of canid and human remains from Ust’-Polui demonstrate that both were consuming freshwater protein; indicating that the humans were feeding the canids. Our results demonstrate that the mandible may not evolve as rapidly as the cranium and the mandible is not reliable for identifying early dog fossils. In AN EFFORT TO SETTLE THE DEBATE ABOUT THE ORIGIN OF DOG DOMESTICATION, A TECHNIQUE THAT USES 3-D SCANS OF FOSSILS IS HELPING RESEARCHERS DETERMINE THE DIFFERENCE BETWEEN DOGS AND WOLVES. In the ongoing debate, one camp believes dogs were domesticated in the Paleolithic age (more than 17,000 years ago), when humans were hunter-gatherers. The other camp believes domestication occurred in the Neolithic age (17,000 to 7,000 years ago), when humans first established agriculture and civilizations. Abby Grace Drake, a senior lecturer in the Department of Ecology and Evolutionary Biology, and her colleagues have been analyzing 3-D scans of ancient fossil canid mandibles to determine whether they belong to dogs or wolves. The answer, they find, is not so simple. To seee the full reports, go to the links provided. From the pics, they look like dingoes, our only indigenous wild dog. Foxes are an introduced species, but they're a different matter. There is historical evidence of dingoes being domesticated by Australian Aborigines in ancient times. Ever heard the expression, "Three Dog Night"? It comes from the nomadic Aborigines curling up with their dingoes at night when it's cold in the desert. They do look like dingoes maybe a little more stocky, but you see where they live. Shorter is better at high altitudes. And the two have a similar howl more like a wolf than a dog. I loved the singing lol. Did these dogs get here via the great human migrations? The larger canine species, Dire Wolf in North America was evolving separately from humans. The Dire Wolf evolved differently than canines in Eurasia. Dire Wolf had to take down Mega Fauna. "The Wallace Line is an imaginary boundary that runs between Australia and the Asian islands and mainland. This boundary marks the point where there is a difference in https://www.thoughtco.com/the-species-concept-1224709" rel="nofollow - species on either side of the line. To the west of the line, all of the species are similar or derived from species that are found on the Asian mainland. To the east of the line, there are many species that of Australian descent. Along the line is a mix of the two and many species are hybrids of the typical Asian species and the more isolated Australian species. At one point in time on the https://www.thoughtco.com/eras-of-the-geologic-time-scale-1224551" rel="nofollow - Geologic Time Scale , Asia and Australia were joined together to make one giant land mass. During this period, species were free to move about on to both continents and could easily stay one species as they mated and produced viable offspring. However, once continental drift and plate tectonics started to pull these lands apart, the large amount of water that ended up separating them drove evolution in different directions for the species making them unique to either continent after a long period of time had passed. This continued https://www.thoughtco.com/what-is-reproductive-isolation-1224815" rel="nofollow - reproductive isolation has made the once closely related species much different and distinguishable. Even though the Wallace Line theory holds true for both plants and animals, it is much more distinctive for the animal species than the plants." My guess is that they did. I would postulate that they were domesticated, or at least semi domesticated by the time they reached Australia, bearing mind that it wasn't an overnight trip. I suspect that they would have cottoned on to the idea that humans were an easy source of food, and followed them on the great journey. Incidentally, years ago when I was in Thailand, I saw a man who, to me, was phenotypically Aboriginal, and he had with him a dog that was, IMO, identical to a dingo. Obviously they weren't Australian, but I've often wondered if their original ancestors stayed behind in Asia to become the indigenous tribesmen, and dogs, of today. How do you like the ads of the dogs in Halloween costumes, (chewy.com), I am not sure they come up for non-Americans. I like the pope pup, although I imagine that some might choose to be offended by it. I can't imagine many dogs sitting still to wear such things. But enough silliness, I believe there are two basic types of dogs?? Scent dogs (with blood hounds being the king), and sight dogs (such as pointers??). Does this division extend to all dogs? It would seem like it would show that dogs were selectively chosen to reinforce these characteristics. I am not sure what a pug is, definitely not a scent dog, but I think their eyesight is relatively poor also. I have heard that one difference between a wolf and a dog is that if you point at something, the dog will look where you point, whereas the wolf will pay attention to your finger. I imagine that the first part is not universally true, but still it makes for an interesting distinction which probably originated in domestication. Yea I see the Chewy ads. Wow Big Bro is watching eh? I think hounds have superior sense of smell over other breeds and certainly all breeding was and is specialized. Interesting bit about the Welsh Corgi. It seems they were bred as cattle driving dogs. Their job is to nip at the ankles of the cattle if they stop moving along. When nipped the cows swing out -stiff-legged to kick the dog but since Corgi legs are so short the angle allows the Corgi to remain un- kicked. The dogs don't move and the big 'ol cow hoof just clears the dogs by millimeters! lol. So that is why there are no tall Welsh Corgies? Are you sure that is not a tall tale?? (or a short tail as the case may be). There was a one page article about bloodhounds in National Geographic once, amongst other things it said that bloodhounds have problems telling (the scent of) identical twins apart, in other words their schnozes can detect individuals on the genetic level (but thus have a difficulty with identical twins). It is interesting how much in the last 20 years companion dogs have proliferated. Dogs that can smell when their "guardians" diabetes is acting up, or dogs for veterans with PTSD, etc. Far beyond just seeing eye dogs. I think health centers at colleges using cuddly dogs to calm down and help distressed students out is perfectly fine. I think getting that upset about an election is pretty bogus, but the use of dogs (or cats) is cutting edge. The dogs are at least good for something, which I am not sure the counsellors are. But enough silliness, I believe there are two basic types of dogs?? No, there's at least one other. Stupid dogs. My Jack Russel/Staffordshire terrier cross doesn't point, but her hearing is phenemonal. She hears something that we can't and then starts barking at it-at all hours of the day and night. Many, if not all of current day dogs have been deliberately bred to what they are today, causing some life long abnormailities and illness. Why can't we leave well enough alone? In 1675 John Olgilby created the first road map of Britain. Terry Jones (from Monty Python) did a good film series on the political motives and retraced the ancient routes in Ogilby's Atlas. At one point Jones is talking with a welsh farmer and Jones notices the Corgi does not move an inch as the cows great pendulum leg swings out just barely missing the little dog. The farmer explains to Jones that the Corgi was bred for that and they have one other talent. Jones gives the farmer a franciscosan look. Since the dogs went from Wales to London dozens of times a month they knew their way very well. Farmers would sell the Corgis in London and soon enough the little guys came right back home. Yea we should leave them alone. Jack Russel is rat killer, I bet he can do some serious Digging. Lots of people in UK use the dogs over pesticides. The rats are mostly immune and mistakenly lots of other animals die from the rat poison. Now that is something to behold, the Terriers are very efficient killers. Capitalism is a bad motive for pet breeding. Even if you don't have puppy mills, breeders probably don't have much motive to check out the breeding history of their animals. I have posted it in another thread, but I'll mention it here. There are the Monks of New Skete in New York who breed and train German Shepherds. They will train other dogs too and have books and videos for it. They have the breeding history of the dogs they have, and are careful about pairing them up. They are expensive, but if you don't want, say, hip problems for your German Shepherd, and want a well trained, well tempered dog, you probably can't do any better than them. They have a lot of demand. Monasteries have to be self-sufficient and so they develop craft industries, brewing beer, painting icons, making cheesecake (the monks of New Skete again, looks delicious), and breeding and training dogs. DNA analysis shows that farming and dogs ability to digest starch dates to Europe, 6000 ybp & Asia 7000 ybp. The gene -AMY2b- developed in humans first. A number of breeds split with dogs 15,000 ago. Also found that street dogs in China and India have unique missing link genetic markers. That's a bottleneck right there. The tan coloured dog in the middle resembles a dingo in some respects. I wonder if the dogs you mention and dingos could share that gene? 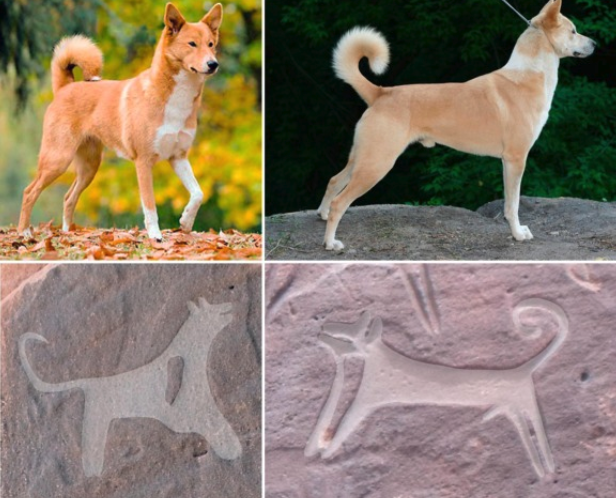 Dingoes are a missing link too, like the China & India dogs. They are less likely to have the gene that allows digestion of starch. So they split off genetcally before true domestication maybe out of one place in Asia. Last week on BBC radio, there was a story of an experiment which required animals to cooperate in order to do a task (get a reward), wolves scored better than dogs. Elephants did quite well also. Much as I love dogs, I think domestication makes them a little more stupid than their wild half-cousins. But, maybe as far as intelligence is concerned, they are reliant and not necessarily separate from humans in their intellect. Are wolves learning a benefit from being around humans? Inevitably assuming a role that their ancestors discovered as an aid for survival. Wolves in Italy are making a comeback after near extinction. If they hid from humans how would they even begin a co reliant relationship? Do you remember any of the tests? It was just a story on BBC radio last week, they mentioned the results, not the tests. BUT, it was not wolf/human or dog/human cooperation, it was wolf/wolf cooperation, dog/dog cooperation, elephant/elephant cooperation. I think you may have misunderstood what I (and they) were saying, my fault. But what is interesting, again is wolf/wolf team was more cooperative than a dog/dog team. Another somewhat interesting fact is that at some point after wolves had been domesticated and eventually became domestic dogs, a black genetic mutation developed in the dogs. Later, through interbreeding between domesticated (black) dogs and wolves, probably in prehistoric or early historic times, the black gene was passed on into the wolf species. And now black wolves are common in North America, and also found, to a lesser extent, in Europe and Asia. To the best of my knowledge, this is the only instance of a gene originating in a domesticated species that has been passed on back into a wild species. Like everything in the world, occasional and unexplained genetic mutations have led to variation in basic genomes to create a different form of being, plant or animal. I was amazed to read recently that all blue eyed people in the world share one ancient genetic ancestor. I daresay that other scientists will discuss and expand on it as time goes by. So, would the same thing apply to the dog/human relationship over time. Was their mutual dependability and companionship based purely on domestic evoloution or did DNA mutation occur which "drove" the closer relationship? Another point being that some societies have a different relationship with their dogs. Like food. or for that matter, sacrifice. This newly-published genomic map of dog breeds is the most expansive yet published. To construct it, the researchers attended dog shows and contacted dog breeders over a period of 20 years to obtain samples of blood or mouth scrapings. The collected samples were genotyped from 938 dogs representing 127 breeds, as well as nine wild canids. They combined those data with genotypes retrieved from publicly available sources, and merged them into a single dataset comprising 1,346 dogs from 161 breeds developed on North America, Europe, Africa, and Asia. Analyses of this dataset reveals 23 clades, or clusters, of dog breeds (Figures 1 & 2). My mother and I took the dog (Australian Silky Terrier) on a walk to the local Catholic church/school parking lot, in front of it was a manager, and joining the three wisemen, Joseph and a sheep, etc, were three photo cutouts of coyote (they're God's creatures too, so why not). I am sure some prankster put them out. But anyways, I was surprised when the dog reacted to the two dimensional cutout of the coyotes. growling and put off by the cutouts. I always thought dogs didn't pay attention to two-dimensional stuff, and tv, so forth. I have a Terrier/American Pit Bull cross. She watches TV most of the night, and if she sees a strange animal, runs up to the TV, barking and making a fuss. Just goes to show that science isn't always up to date on some matters. But isn't it strange than, in many respects, dogs have developed more of the better characteristics than some humans? I was told by another friend that they put up coyote cutouts at other nativity scenes around town to keep (wild) animals away from them, and here I thought it was some kind of anarchical alt left whimsical impulse. Or is it that humans have developed better characteristics in dogs? And some the worse characteristics too. (I think of inbreeding, and endemic problems for certain breeds). They say that if you want love in DC, get a dog (or maybe a trophy wife??). Wolves have adapted to us and the ocean along with cows, camels and other Ungulates. And they may be doing it again. In British Columbia two groups of wolves have been living side by side without much genetic mixing. The wolves on the plains eat what you would expect and the wolves on the rocky coast, eat seafood. The island wolves look different and blend into the red clay shorelines. They have extra skin between their toes that look like webbing and the head has a rounded Pinniped or seal like appearance. There is a common ancestor between seals/ killer whales/ walrus and wolves. Each of those marine mammals have great genetic distinction with each other. They are more closely related to dogs, cats and weasels than they are related to whales, matinees and dolphins. In 2009 genetic research into marine mammals including those who descend from Ungulates and Tetrapods show that each group came through transformation to marine life by unique genetic routes. Even though the genes for fins and flippers looked the same (morpho genetic) they had different chemistry. The coastal wolves eat salmon, lots of parasites. Since bears hibernate they kill the tape worms they might ingest with starvation before tape worms kill the bear. A wolf would be dead from eating salmon flesh however these wolves are adapting. Bears usually only eat the skin and heads of the fish and so they avoid ingesting the parasite. Wolves do the same. Here is a look at them. There are coyote-wolf hybrids in some of the Mid Western states, (Coywolf(?). They are smaller than a full size wolf, and are not afraid of man, but like a lot of coyotes do, live on the fringes of cities. Of course, in another thread we talked about the Russian silver fox, and the attempt to domesticate them for their pelts. The domestication was successful, the foxes were tamed, but something about the domestication genetically made it so their pelts were no longer silver (and desirable), but like a dogs, a motley mix of colors. Like how some breeds have different colors, even a patchwork of them. Trained foxes are available for purchase, although some skeptics say that one cannot fully domesticate (and trust) a wild animal. I would agree that all dogs retain some natural instincts and only dependence on humans could allow for breeding tameness and cooperative behavior. Last week a very vocal pro-pittbull owner was killed and partially eaten by her two pit bulls. Good article, loony lefty Twitter journalists trying to lie about circumstances naturally. Shortly after officers found Stephens’s body, guarded by her two dogs, they began talking about how to catch the animals. When they turned back around, they saw that the dogs had walked over to the body. A friend of Stephens was later able to capture the dogs, the sheriff said. Dogs have somewhat of a reputation for guarding the body, but not eating it. Cats seem to believe that good meat should not go to waste. But of course, a house cat probably could not kill a human, no matter what the circumstances. I am sure the dogs were not eating the rib cage, rather were trying to get at the tasty mortals underneath and around the rib cage. Like they say, the way to a man's heart (or woman's in this case), is through her stomach, and then up! If one did not laugh at the human condition, one would cry. Last night on "Nature," they had a show on cats, and one thing they talked about was how dogs developed a keen sense of smell and a long nose. What this did, however, was limit their biting power. Whereas cats kept a short nose and were/are more effective killing machines. It was that killing (of mice) by domestic cats that was prized by humans over the centuries, however, their killing of small animals has become disliked and may be bred out of them by humans, seeking them only as companions. There was also a story 2016 summer in NYC. A Catholic priest actually witnessed and the attack tried to help the victim. These dogs lived in the neighborhood near Catholic church. The victim was a man who had been painting a building to the side of the church. These two dogs attacked him & ate some of his flesh. You can see his the man's intestines being pulled out.